Thanks to badkittyuno for writing this review or I might never have known about this great book. I started it on Sunday and finished it today, and thoroughly enjoyed most of it. Dr. Melinek is a forensic pathologist who spent two years as a fellow working in the New York City’s Office of the Chief Medical Examiner. Her time there was interesting for many reasons, including the fact that she worked there during the fall of 2001, when the city was dealing with deaths from 9/11, the Antrax attacks, and a plane crash in Queens. It makes sense that this book would interest me. A couple of years ago in a Pajiba comment diversion, I shared a bit about what I do for a living. I still do that work, and am still learning, so the parts of this book that I found myself highlighting were in the chapter on the response to 9/11. There were a few comments in there that I found to be pretty helpful and that I’m going to look into incorporating into our plans. So from that perspective, the book was quite helpful. But it was also well written. While I’m sure each chapter has some cohesive theme (as Dr. and Mr. Melinek don’t just write chronologically), I don’t think it was necessarily broken down into obvious chunks. And yet the topics all flowed well, and flowed naturally. The storytelling was engrossing, fascinating and, from my experience working with MEs, not fantastical or exaggerated at all. A couple of quibbles: autopsy reports are generally public information, so I recognize that Dr. and Mr. Melinek aren’t breaking any laws in sharing this information, but some parts felt a bit like a breach of ethics. Mostly, her interactions with grieving family members. Unless names were changed, or permission granted (which I doubt), some of the stories she told seemed like they could really cause additional pain for the family members. Who knows if any of them will read this book (probably unlikely), but it made me think a little bit of that ABC hospital documentary that showed the death of someone whose wife unsuspectingly saw it on TV a couple of years later. It was traumatic. Obviously stumbling on a TV show is easier than deliberately reading a book, but what if a friend or relative of one of the cases discussed reads about it? I’m not saying that the book shouldn’t be written, or that the concerns of a couple of people should prevent sharing information that sheds light on this very important field, but I did think about it. I’m also a bit frustrating with the Dr.’s constant reference to death by suicide as selfish. I cannot directly relate to her direct experience with death by suicide (her father’s), and she is certainly entitled to view her father’s decision as selfish, but that characterization always strikes me as reeking of victim blaming, and I found it especially off-putting when she projected her feelings about it onto others who died by suicide. Even with those reservations, I do still strongly recommend this book for anyone looking for a surprisingly quick read on this topic that is both interesting and thorough. Off the Wall: Death in Yosemite by Michael P. Ghiglieri and Charles R. “Butch” Farabee, Jr.
I’ve just finished a week-long family vacation spent about 10 minutes south of Yosemite National Park. The first day we went into the valley, my husband and I hiked about 7 miles, and stopped into a few of the little stores. Everywhere we went, this book was on the shelves. If you’re familiar with any of my favorite books, it shouldn’t surprise you that this book caught my eye. Off the Wall is a well-written, fascinating, long (nearly 600 pages) book that covers all of the unnatural deaths that have taken place within the park since the white men dropped down into the Yosemite Valley. It’s a delicate balance of sharing stories and tryng not to make every person (other than those who died by suicide and homicide) sound, well, stupid. But it’s hard, because man, people do some really dumb things in national parks. 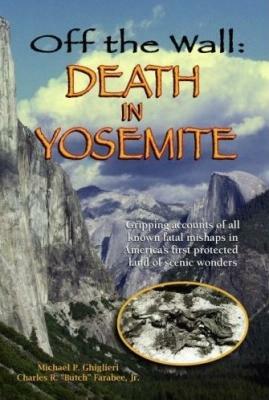 Fewer than 800 people have died traumatically within the whole of Yosemite since the 1850s. Many did things like stepped over the railing onto slippery rocks at the waterfall to get a better picture, or went hiking without good clothing, map, and compass, or overestimated their rock climbing ability. Some were victims of freak accidents, like the constuction truck with failed breaks that crashed into a car and buried the occupants with hot asphault. And others chose to make Yosemite their final resting place after they decided they didn’t want to be in the world anymore. I started reading this on Tuesday evening, and just finished it on Saturday morning. So much of it is just intriguing, and it was difficult to put it down. I appreciate that the authors have real experience in this area and weren’t just doing a retrospective study – one of them served in Search and Rescue within the park and was involved in many of the attempted rescues outlined in the book. But they also did some fantastic research, getting details from local papers from the 1800s. I also appreciated that they treated the killing of the original inhabitants (the Native Americans) by white men as murder. A couple of times the book felt a little condescending, and some language they chose to use (like referring to undocumented immigrants as ‘illegals’, or how they described suicidal people) is so outdated and insensitive that it took me out of the book on occasion. But overall, if you want to be both educated on the ways your fellow man and woman can screw up, as well as inspired by the ways park employees try to save these folks, this is a good book to check out. We have been having a fantastic week up here in Yosemite. We are staying just south of the park’s gate, and we’ve gone into the valley four times in a week. Austin and I went on a seven mile fairly easy hike the first day, then two days later went back for another 13 miles on the valley loop trail. My feet are destroyed. Today we went on a four-line zip line tour of the forest, which was gorgeous. And each evening we’ve been playing games, drinking wine and having just a general blast. It’s great to get to see my three year old niece, and my extended family (as in, my in-laws). We head back to Seattle tomorrow, and while it will definitely be sad to say good-bye to folks and this lovely setting, it will also be really nice to get back to Seattle, and the kittens.